Digital technology is changing our life. We all use modern digital devices. Examples include: mobile phones, computers, calculators, digital TV, the internet, tablets, CD, DVD, MP3 players and so on and so on. Almost all these examples of digital technology are new. They have been invented within your or my lifetime (the last 20 to 30 years). Your parents didn’t have any of these things. What did they use instead? Books and libraries instead of the internet. Slide rules and abacus instead of calculators. Gramaphones and tape cassette recorders instead of CD, DVD and MP3 players. Board games and sport instead of computer games. During World War II, the British created the first computational machine to crack the German’s secret code. The machine was at Bletchly Park in England. It was largely the idea of Alan Turing. Today Alan Turing is considered the father of computers. In 1947 the transistor was invented. This lead the way to more advanced digital computers. 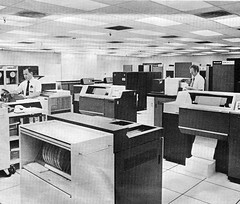 In the 1950s and 1960s, the military, governments and other organizations had computer systems. The Whole Earth movement of the 1960s led to the inspiration and eventual creation of the World Wide Web in 1992 by Tim Bernard Lees. The first personal computers came out in the 1970s but were expensive. The were used mainly for business. In the decade of the 1980s computers became familiar machines to the general public. Millions of people bought computers for home use. Some popular home computers of the 80s were the Sinclair ZX Spectrum, the BBC Acorn and Commodore 64. There were 17 million Commodore 64s sold between 1982 and 1994. By the late 1980s, many businesses became dependent on computers and digital technology to operate. Names we know today appeard such as Microsoft and Apple. These computers were designed for office use. By the end of the 1980s, having some knowledge of computers became necessary for many jobs. In 1992 the World Wide Web was released to the public. By 1996, the Internet was in the mainstream consciousness and many businesses listed websites in their ads. By 1999, almost every country had a connection, and more than half of all Americans used the Internet on a regular basis. In 1989, 15% of households in the United States owned computers, by 2000, this was up to 51%. Cell phones became a common sight in western countries, with movie theaters beginning to show ads telling people to silence their phones. After revolutionizing society in the developed world in the 1990s, the digital revolution spread to the masses in the developing world in the 2000s. In late 2005 the population of the Internet reached 1 billion, and 3 billion people worldwide used cell phones by the end of the decade. If your 1 in a million in China, there are 1,300 people just like you. China will soon be the No.1 largest English speaking country in the world. 25% of India’s population with the highest IQ’s excedes the USA’s entire population. There are more honors graduates in India than kids in the USA. The top 10 most in demand jobs in 2010 did not exist in 2004. We’re preparing students for unknown jobs using tech that doesn’t exist to solve problems that we don’t know are problems yet. According the the US department of labor: Todays students will have had 10 to 14 jobs by the age of 38. 1:4 workers has been in their current job for less than one year. 1:2 less than 5 years. 1:8 married couples last year met online. There are 200 million registered Myspace users. That would be the worlds 5th biggest country. Bermuda has the worlds No.1 largest internet penetration. USA is 19 and Japan in 22. Moor’s law says that computer speed doubles and price halves ever 2 years, has done since 1960’s and will do so until 2020 at least. In 2006 there were 2.7 billion searches on Google per month. In 2010 there were 31 billion searches on Google per month. What did we do before we had google? The 1st commercial text was in 1992. Today there are over 6 billion texts per day. It took radio 38 years to reach a market audience of 50 million. TV took 13 years, Internet 4, iPod 3 and Facebook just 2. The No. of internet devices in 1984 was 1,000. In 1992 1,000,000 in 2008 1,000,000,000. There are 540,000 words in English. That’s 5x Shakespeare’s day. 1 weeks New York Times contains more information than one man’s lifetime information from 18th century. The amount of information increases 4 exabytes per year (4 x 10^19). More info in 1 year than in the previous 5,000 years. Amount of tech info double every 2 years. University degrees obsolete before finished. NTT Japan can put 14 trillion bits/second down a single fiber. That’s 2,660 CD’s or 210 million telephone calls per second. This is increasing at a rate of x3 every 6 months and will until 2020. By 2013, the computer will have exceeded the computational power of the human brain. By 2049, the human species. Every 4 minutes and 30 seconds: 67 babies are born in the USA, 274 in China and 395 in India. Also 694,000 songs are downloaded.